As great as laptops are, they can sometimes be too big for certain situations. On the other hand, tablets can be ultra portable but lack some of the functionality of laptops. 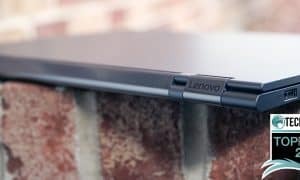 Our Lenovo Miix 320 review takes a look at a 2-in-1 solution from Lenovo that you can use as a laptop or a tablet depending on your current needs. 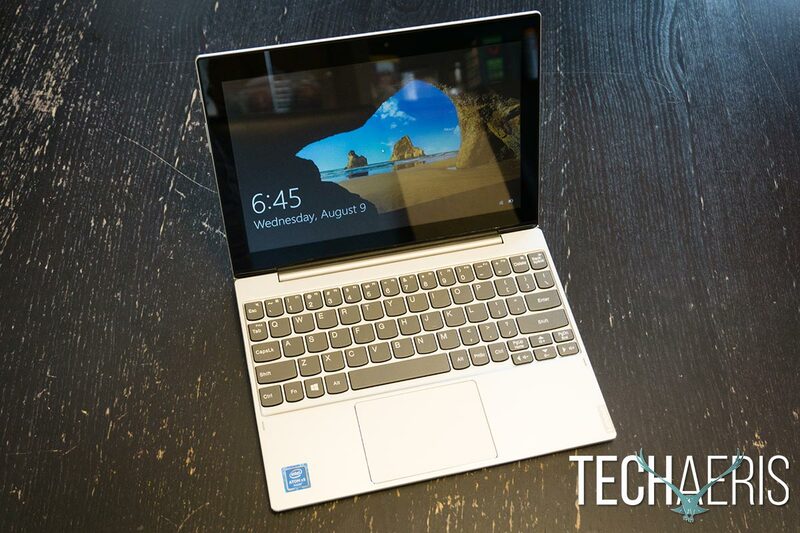 At a glance, the Lenovo Miix 320 looks like a tiny laptop. 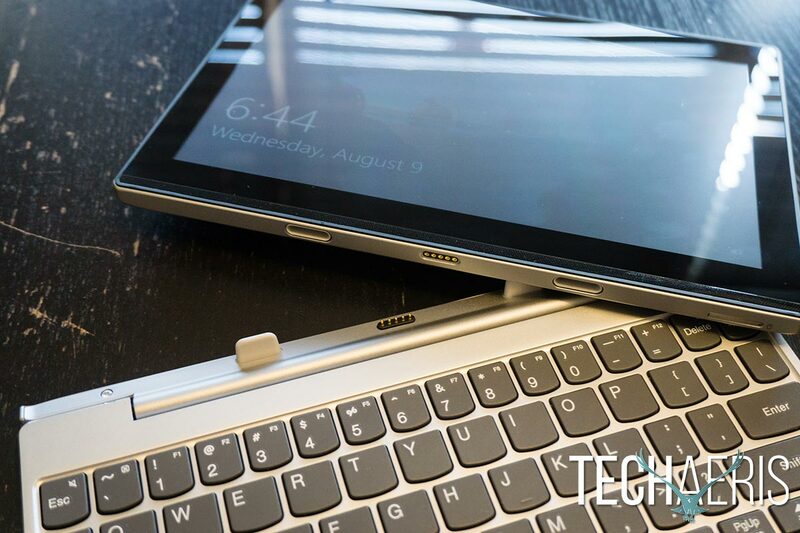 The tablet casing, as well as the keyboard itself, features a solid metal construction. 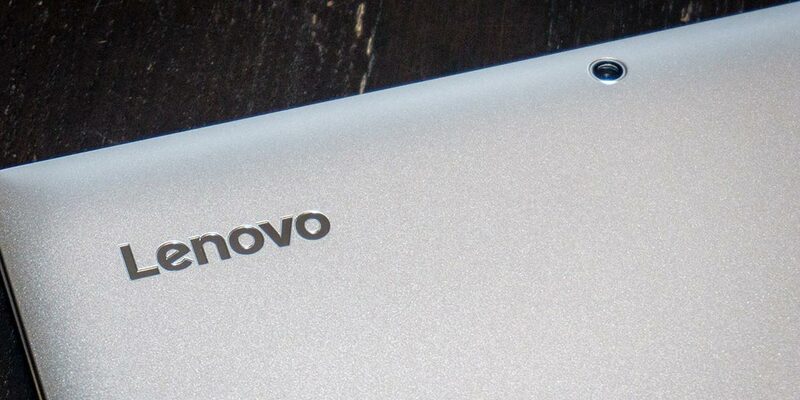 When closed, the Lenovo logo is in the upper left-hand corner with a rear-facing camera in the middle at the top. The Lenovo Miix 320 back tablet view. When opened, you are greeted to a standard-sized five-row keyboard with your usual function row at the top. The arrow keys and home and end buttons are in the lower right-hand corner and are of the half size variety. As far as typing goes, the chiclet-style keys are fairly soft, but typing is responsive. The Lenovo Miix 320 features a detachable keyboard. Located in the middle of the palm rest of the keyboard is the touchpad. The edges of the touchpad are nicely beveled as well as the outer edges of the keyboard itself. On either edge of the keyboard near the back is one USB 2.0 port for a total of two ports. Flipping the keyboard over, there is one long rubber foot near the back and two smaller feet towards the front. The USB-A ports are on the keyboard (one on each side) while the other ports, volume, and power buttons are on the tablet portion. The tablet portion of the Lenovo Miix 320 attaches to the keyboard by way of a 5 pin connector and two magnetic “Pogo Pins” which hold the display in place. The tablet portion looks fairly typical aside from the 5 Pin connector and receptacles for the two tabs. On the left edge of the tablet are the power button, the volume rocker, and 3.5 mm audio headphone jack. On the right-hand side are the power port, USB Type-C port, mini HDMI port, and microphone. Interestingly enough, the power port and headphone jack are very similar sized and more than once I found myself trying to plug it in via the headphone jack. On the bottom of the tablet, where the 5 pin connector is located, is a micro SIM card slot. The left hand edge of the Miix 320 and keyboard. The front of the tablet, of course, is where you will find your display. 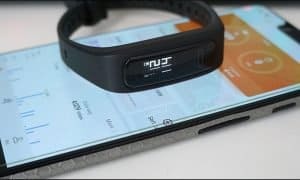 The bezels on the display aren’t that large, however, the typical black frame around the display decreases the available screen real estate. The front-facing camera is located in the typical top middle of the tablet when held in horizontal mode. The stereo speaker strip is located along the bottom, also when the tablet is held in horizontal mode. 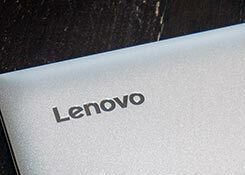 The design of the tablet portion of the Lenovo Miix 320, is conducive to use in landscape mode. As mentioned above, when attached to the keyboard the tablet is held in place with fairly strong magnets. Even when held upside down, the screen stays in place firmly attached to the keyboard. When pulling the tablet off of the keyboard, a little bit of force is required. Overall, the Lenovo Miix 320 is a solidly-built, sturdy, sleek-looking two-in-one tablet/laptop. The 10.1″ display isn’t too bad under most lighting conditions and for the most part is pretty decently visible at 75% brightness. However, once you hit brighter lighting conditions — outside for one — the screen becomes difficult to see even at 100%. The 1200×800 resolution display is o.k. in most lighting conditions but can be hard to see in brighter areas, even at full brightness. Aside from outside viewing, the colours are fairly accurate as well, and not overly saturated. The biggest drawback of the screen is that it sports a resolution of 1200×800, and I’d honestly love to see at least a 1080p resolution on a screen of this size. It’s not the end of the world, but the bump would add just enough resolution to make the screen just that much more crisp. The Lenovo Miix 320 comes with Windows 10 installed and doesn’t have as much typical Lenovo software as you used to find on Lenovo systems. The pre-installed software you will find are the Lenovo Companion, Lenovo Account, Lenovo App Explorer, McAfee, and Microsoft Office trial applications. There are a couple of new pre-installed apps that I haven’t seen before which include Keeper Password Manager, Drawboard PDF, and Phototastic Collage. There are also a few pre-installed games including March of Empires: War of Lords, Asphalt 8, Royal Revolt 2, and Candy Crush Saga. Even though Lenovo trimmed down their own software applications, there are plenty of others pre-installed to make up the difference. 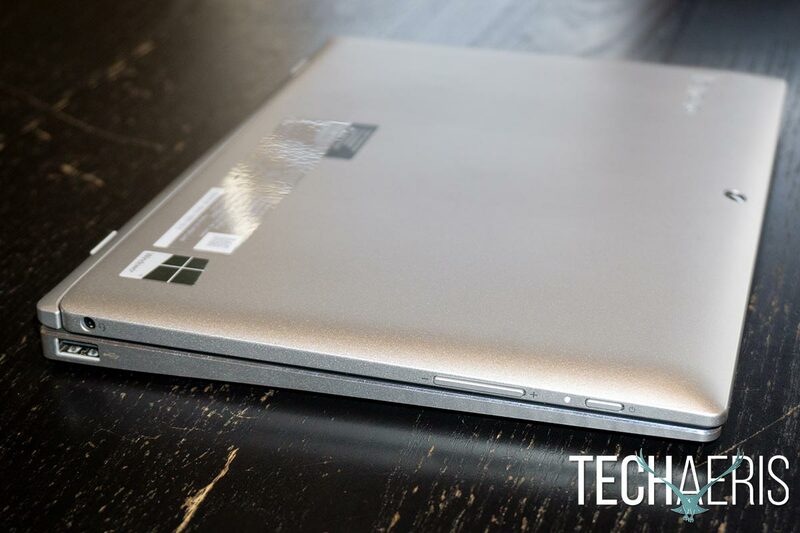 As far as Windows 10 goes, and as we’ve mentioned before, it works well with the 2-in-1 format. When the Miix 320 is being used with the keyboard attached, Windows 10 functions like you’d expect on any laptop or desktop computer. When you remove the keyboard, Windows asks if you want to switch to tablet mode. Should you choose to do so, the tablet mode works well with its touch-focused interface. 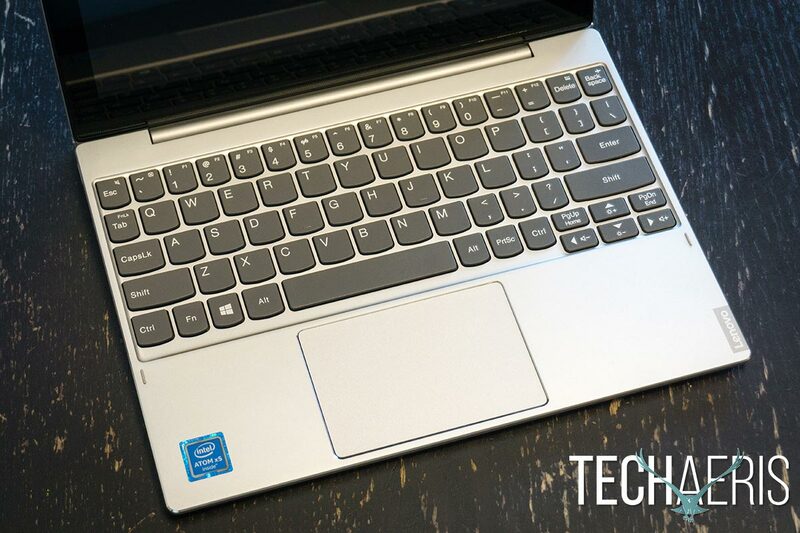 We’ve reviewed a couple other versions of the Lenovo Miix series in the past and were impressed by their performance. 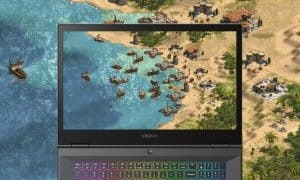 Unfortunately, due to the smaller form factor, Lenovo has opted to use the Intel Atom x5 processor and as a result, performance really is a mixed bag. When using local apps, like Wordpad, the Miix 320 performs quite well. Basic games like Candy Crush Saga and even Blizzard’s Hearthstone ran fine as well. Going online is an entirely different story. While online, browsing seemed to be slow regardless of network (I tried three different wireless networks) or browser. In both Chrome or Edge, trying to do online word processing was a serious pain. More often than not I could type a string of words and watch the computer slowly catch up over the course of the next minute or so. The issue was compounded when you try to delete a previous character because I made a typo, but couldn’t see what I’d just typed and had to sit and wait to make sure I’d deleted the right number of characters. The online editing tests were done in both Edge and Chrome with one tab open. Once you start to hit three open tabs browsing really becomes sluggish. 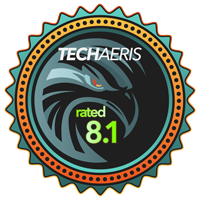 Testing was done with both Office 365 Online (Word and Excel) and WordPress. The interesting thing is that sometimes it started out fine and then started to lag after a couple minutes, other times it was fine, and the odd time typing lagged to the point it was unbearable. That’s really unfortunate because the small form factor really screams portability and it’s an excellent size to take with you on the road to conserve space. Interestingly enough though, once a YouTube page finally loaded, the video streamed just fine, and the same went with streaming from Spotify Music. The location of the speakers on the tablet portion of the Miix 320 is nice when used in laptop mode and if you’re using the tablet in landscape mode. Sound is pretty clear and crisp, and does get quite loud at maximum volume. For the most part, I was able to get away with having the volume at 60% to adequately watch videos and listen to music. As with most tablet speakers though, the bass end of the spectrum is severely lacking – so much so that there isn’t any. The Lenovo Miix 320 sports a 2MP front-facing and 5MP rear-facing camera. While smartphone cameras are slowly closing the gap between phone and standalone camera quality, tablets still remain the opposite. The same is true for the Miix 320 and while the 2MP front-facing camera is more than sufficient for Skype or video chatting, the quality for front camera selfies or photos from the rear camera are what you’d expect with 2MP and 5MP cameras. During our testing, I was able to get on average 6 1/2 hours of battery life on a single charge. This consisted of alternating between 50/75/100% brightness based on where I was using it. For the most part, I spent my time editing documents, browsing online, and watching the odd video or streaming music — mostly with the keyboard attached. 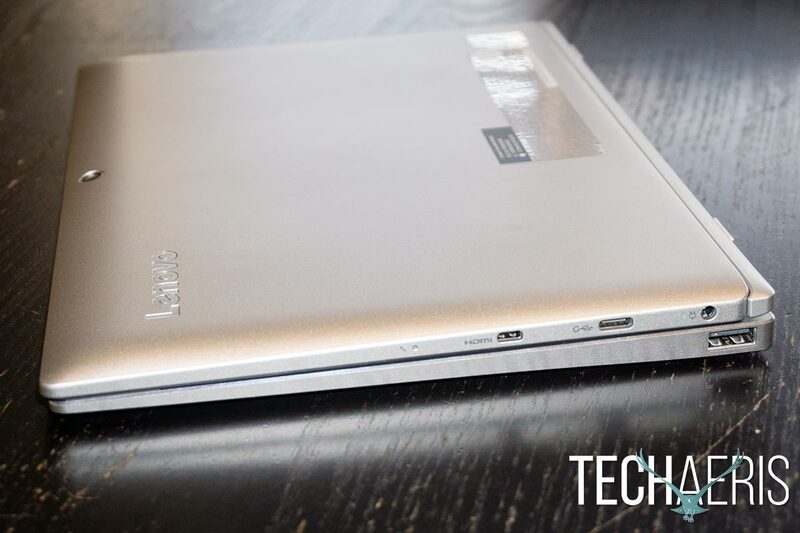 Starting at $199.99USD, the Lenovo Miix 320 is definitely priced for the budget crowd. As reviewed, our configuration will run you $299.99 at Costco (it’s currently listed as coming soon on Lenovo’s website). If you plan on using local apps, like Microsoft Office, basic web browsing with a single tab open, and watching the occasional video or streaming music you should be o.k. with the Miix 320 at this price. 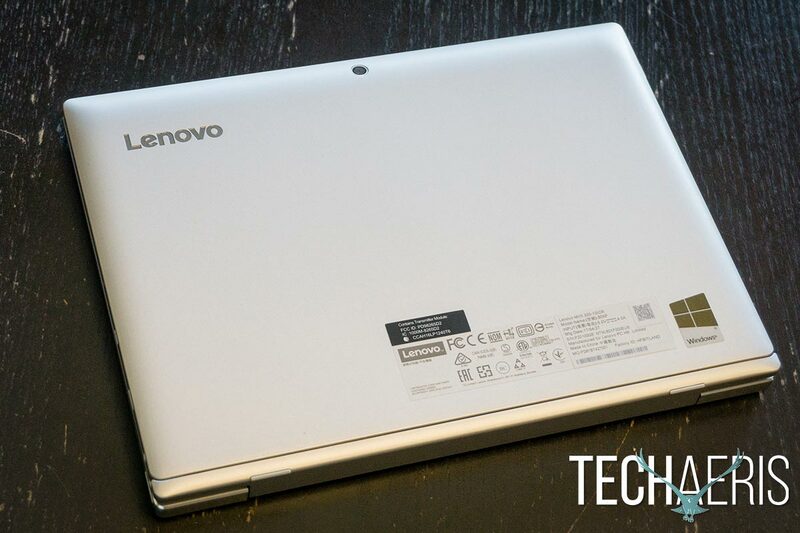 *We were sent a review unit of the Lenovo Miix 320 2-in-1 for the purposes of this review.